If you use updated Gmail app, then you will get lot of latest features at your smartphone. Gmail is a powerful platform with many productivity-enhancing features. But most of the Gmail users use only a little bit percentage of available actual Gmail features. In this article we have to discuss top 5 great Gmail tips and tricks for Android smartphone. 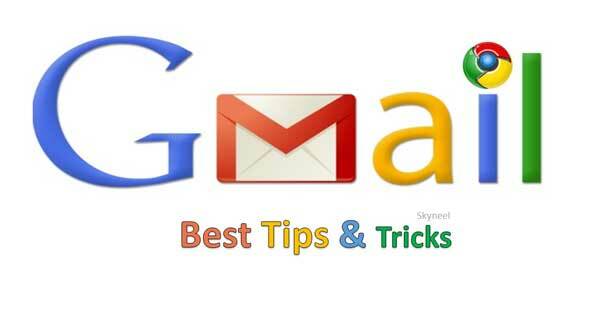 Most of person don’t have enough time to search about the Gmail tips and tricks. So, that we brings you latest and top useful great Gmail tips and tricks for Android. Before starting, make sure you’re have latest version of Gmail app, if you not then update your Gmail app form Google Play Store and checking for updates. All know very well how to add or configure an email with your Gmail account. In this article we found out and bring best Gmail tips and tricks so you can start using them right away. Many Gmail users don’t reliaze that Gmail has a feature which gives you time to recall your send message. Sometime, you accidentally send a wrong email to others and don’t know how to recall a send message. It’ll be frustrating situation, now you can easily recall or undo a send message by Gmail. You have to turn on “Enable Undo Send” feature from Settings window. When you tap on the send button you will get an notification your message is sent with undo option. If you tap on the Undo option you will get back to the compose box and make required editing or discard the message as per your need. On daily basis you will get lot of email’s at your Gmail app. There is no need to open the received mail and read the complete message. You’ll get an idea and know that simply seeing the subject line is enough to know what you need to do with it in many cases. So, to quickly deal with all your incoming stream of mail, you can assign swipe actions, which means you don’t need to open it to archive or delete it. Gmail has expanded its swipe options to with different range of actions, including Archive, Delete, Mark as read / un-read, Move to, Snooze and None. To assign your swipe action, open the Gmail app and hit Settings > General settings > Swipe actions > Choose any required action as per your need. Do you know Gmail allows you add multiple inboxes at once at your Android’s Gmail app. You can quickly view list of all received messages in multiple inboxes at once. If you already set up multiple inboxes, Android’s Gmail app has a really useful option which allows you to view everything as it comes in across multiple email accounts. The option is known as ‘All Inboxes’ and when you tapping it you will get a list of messages in chronological order regardless of what address they were sent to. It can get a little confusing if you’ve set up more than one gmail accounts. If you view all the message at once then tap on the “All inboxes” option, other wise choose any single inbox to check, delete or reply the messages as per your need. During sending email with attachment take lot of space due to that your internet speed too much slow and attachment occupy storage space also. If you need to avoid this situation than you must have to turn on sync option at your active Gmail account. To turn on auto-sync data you have to go Settings and tap on the three vertical dots and choose Manage accounts. Here turn on “Auto-sync Data” option at your active Gmail account. Gmail allows you to find out emails much faster and easier with the help of latest Gmail search operators. You can easily find out messages faster with new Gmail account and filters the search emails based on size, date, labels, and more. Google has added more ways to find what you’re looking for and, perhaps, clean out those huge emails you no longer need. In latest Gmail find box you can easily find older or newer emails by using the older_than: and newer_than: operators. For example, if you type “older_than:1y” Gmail will show you all messages older than 1 year. You can also use “m” for months and “d” for days at the place of “y”. To find emails larger than a specific size, you can use the larger: operator with the size of the email and K for KB and M for MB. For example, If you type “larger:500M” will find all emails larger than 500MB. Mute a conversation feature in latest Gmail help you if you don’t want to see any further messages related to it in your inbox. Any emails added to the conversation after you mute it will be stored in your Gmail account but automatically archived. They’ll still be marked Unread if you want to check back over them. To do this from the Gmail app for Android phone, just open a conversation then long tap on the conversation. You can check a right symbol shown as your selected email. Now tap on the three vertical dots or more button, then choose Mute option from the list of options. You can always pull the conversation up from the archive through a search or label filter if you need to find it again.